Keep bacteria, fungi, and allergens at bay by washing your bed linens at these recommended intervals. Q: I’m a stickler for hygiene and never snack in bed, so I don’t imagine my sheets ever get that dirty. How often should you wash your sheets? What about other bedding, like the pillowcases, duvet, and mattress cover? A: Even the ultra-hygienic should regularly wash their bed linens often. Sweat, saliva, skin cells, dust mites, and dirt collect on your bedding every time you hit the sack. Not only does this collection lead to smells and stains, it also turns your bunk into a hotbed of bacteria, fungi, and allergens over time. Some microorganisms can aggravate allergies or skin conditions, cause infections, even lead to illnesses if they remain in your bed long enough to re-enter your body (e.g. through a cut in your skin). It’s generally recommended to wash bed linens every one to two weeks to keep this build-up at bay, but the exact frequency depends on the type of fabric, the type of bed linen, and whether or not you have pets or unique health conditions. So, read on to learn about how often you should wash sheets and other linens to keep your bed as sanitary as it is snug. Wash cotton bed sheets every week. The natural fibers in cotton, cotton-polyester blends, and Egyptian cotton sheets are ultra-absorbent and ineffective at wicking away moisture (i.e. sweat)—and the more moisture trapped in your sheets, the more hospitable they are microorganisms. Washing cotton bed sheets (including fitted and/or top sheets) every week is the best way to banish microorganisms, allergens, stains, and odors. If your sheets have a stubborn stain from food, beverages, or blood, pour distilled white vinegar directly over the stain and let it dwell for 15 minutes, then rinse the vinegar off the sheet under plain cool water. Next, run the sheets through a normal wash cycle with hottest temperature setting recommended (check the care instructions on the sheets for the optimal water temperature) with any standard detergent, followed by a medium to high-heat dry cycle. While higher heat kills bacteria, lower dryer heat lessens the likelihood that the sheets will shrink or fade (if colored). With as often as you should be washing your sheets, though, now might be a smart time to invest in white or light colored sheets that will have minimally noticeable fading. Synthetic fabric or silk sheets can be cleaned every two weeks. Sheets made of silk or synthetic fabrics like polyester and nylon are more effective at repelling moisture than cotton, but that doesn’t buy them much extra time—wash these sheets every two weeks. To clean synthetic-fabric sheets, run them through a normal wash cycle with warm or (ideally) hot water and medium or high heat in the dry cycle to remove buildup. For silk sheets, depending on the care instructions, hand-wash them by kneading them by hand for three to five minutes in a large bucket comprising cold water mixed with silk-friendly detergent (such as Woolite for Delicates Care), then lightly wring them out and air-dry them, preferably on a sunny day to speed up drying time. If the silk sheets are machine-washable and dryable, run them through a gentle wash cycle with cold water, then machine-dry them on low heat. Clean pillowcases weekly. Dirt, makeup residue, and oil from your skin or hair—not to mention dust mites from your bedroom itself—are transferred to your pillowcase on a nightly basis, regardless of your sleeping position. Continuing to sleep on a soiled pillowcase night after night takes a toll on your skin, clogging the pores and potentially causing or worsening acne. • Run cotton and synthetic sheets through a normal wash cycle with warm or hot water and a fragrance-free liquid laundry detergent (powders can leave behind residue that can irritate facial skin), and then run a dry cycle on low heat. 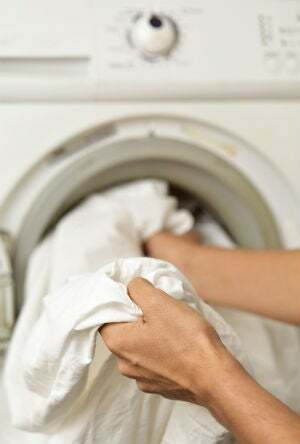 Steer clear of dryer sheets when drying pillowcases; they usually contain softening agents that can irritate facial skin. • For silk pillowcases, depending on the care instructions, hand-wash or machine-wash them as you would wash silk sheets, then air-dry them or machine-dry them on low heat. • If washing printed or colored pillowcases, turn them inside out before washing to preserve their pattern and hue. Wash duvet covers monthly if you use a top sheet. If you sleep with a top sheet sandwiched between you and your duvet, a monthly wash is enough to minimize bacterial buildup on duvet covers of any fabric. 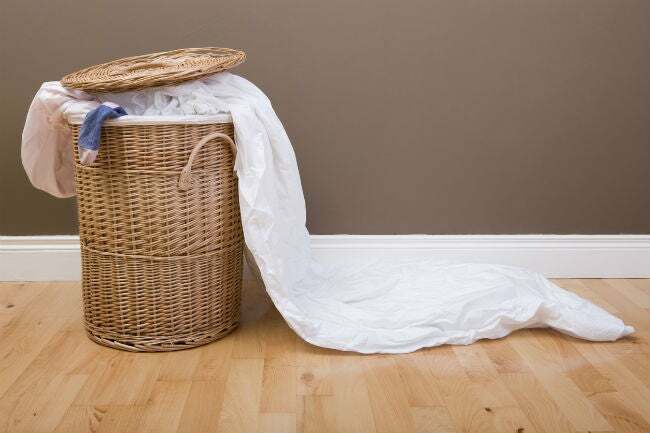 To clean, zip up or snap closed the duvet cover, then run it through the laundry on a normal wash cycle with cold water at the fastest spin speed possible. Depending on the care instructions, air-dry or machine-dry the cover on low heat to minimize shrinking. If yours is a silk duvet cover, hand-wash it as you would wash silk sheets, then let the duvet cover air-dry, preferably outdoors for faster drying. …but, if you don’t use a top sheet, wash duvet covers weekly. Sans top sheet, microorganisms and allergens collect more rapidly on your duvet cover, so you’ll want to adjust your cleaning schedule accordingly. Wash them weekly using the same washing and drying instructions recommended above for duvet covers. Wash mattress covers weekly. As with duvet covers, attaching a cover to your mattress that removes for easy washing is a great way to reduce the buildup of oil, dust, and pathogens on your mattress itself and prolong its life—so long as you wash the cover itself on a weekly basis. Zip up the mattress cover or snap it shut, then wash and dry with the same washing and drying instructions recommended for duvet covers. If you have pets, wash sheets and pillowcases twice a week. When feline or canine friends regularly snuggle up in your bed, you want to clean your sheets and pillowcases more frequently than usual. Twice weekly helps take care of the additional microorganisms as well as allergens like pet dander that furry friends track into your bedding. To banish these accumulations, start by running sheets and pillowcases of all fabric types through a no-heat dry cycle (with a dryer sheet included) to remove pet hair. Then, use the fabric-specific washing and drying instructions recommended above for your bed linen but choose the hottest water and dryer heat settings permitted by the care instructions to ensure pet pathogens are eliminated. If you have allergies or health or skin conditions, wash sheets and pillowcases every two to three days. If you have a respiratory condition like asthma, an allergy to dust mites or other particulates, or your skin is acne-prone, consider laundering your sheets and pillowcases every two or three days to limit your exposure to those elements that can worsen your condition. You can follow the fabric-specific washing and drying instructions outlined above for cotton, synthetic, and silk sheets and pillowcases, but stick to a mild, fragrance-free liquid detergent during the wash cycle. And, since you’ll be washing more frequently, use the Quick Wash or Quick Dry settings (or the equivalent shortest duration cycle) on your washer and dryer to cut cleaning time and energy costs.